Top 10 Healthy Dhokla Recipes, Which Dhoklas are healthy? Top 10 Healthy Dhokla Recipes, Which Dhoklas are healthy? Dhoklas for breakfast. Dhoklas are had for breakfast, snacks or even with lunch and dinner in most Gujarati households. We have a stunning variety of dhoklas from khatta dhokla to innovative dhokla sushi with carrots. So what is the issue with dhoklas? Fist lets look at the healthy dhokla options first. We have analysed 50 dhokla recipes and this is our top 10 healthy dhokla recipes and the reason why they are healthy is explained below. See why we suggest yellow moong dal for healthy dhoklas. Yellow Moong Dal : The fibre (4.1 g in ¼ cup) present in yellow moong dal prevents the deposition of bad cholesterol (LDL) in the arteries which promotes a healthy heart in turn. Packed with nutrients like zinc (1.4 mg), protein (12.2 mg) and iron (1.95 mg), yellow moong dal helps to maintain the elasticity of your skin and help to keep it moist. Fiber, potassium and magnesium from yellow moong dal will work together to regulate blood pressure and soothe the nerves and is diabetic friendly. Try our yellow moong dal dhokla recipe which is made with ZERO rice and hence super healthy. For daibetics, drop the usage of sugar or cut it by half. See why we suggest green moong dal for healthy dhoklas. Moong Dal ( Green Moong Dal ) : Moong dal or green moong dal is rich in Folate, Vitamin B9 or Folic Acid which helps your body to produce and maintain new cells, especially red blood cells and is pregnancy friendly. Being rich in Antioxidants like Flavonoids, mung reduces the damage done by free radicals to the blood vessels and lowers inflammation. Moong Dal is heart and diabetes friendly. Moong Dal or Split Green Gram are high in Fibre and 1 cup of cooked Moong dal gives 28.52% of your daily Fibre requirements. Try this methi moong dal recipe where the addition of methi helps in improving glucose and insulin responses, hence good for diabetics. For a variation, they this low calorie moong dal dhokla recipe which has low fat curds and some carrots and cabbage added to it. Read details of is moong dal dhokla healthy? For those who like chillies, try spicy moong dal dhokla recipe. See why besan is healthy and must be used in dhoklas. Besan has more good fat than whole wheat flour and also higher protein content. Rich in complex carbohydrates and with a low glycemic index, besan is good for diabetics too. Besan is high in Folate or folic acid, which is important for rapid growth and multiplication of red blood cells and WBC’s in the bone marrow. Try the green peas dhokla recipe which is made of besan and green peas. Then there is cabbage dhokla recipe which is besan + cabbage + low fat curds. Cabbage is rich in Antioxidants in turn lowers the risk of infection and inflammation of the body due to eating processed foods. See why sprouted moong is healthy and must be used in dhoklas. Moong sprouts is a nutri-dense sprout. It’s a good sources of several nutrients like b vitamins, potassium, magnesium, phosphorus. These sprouts are a protein boost. Sprouted moong is beneficial in relieving the symptoms of anaemia by building haemoglobin levels due to its high iron count. Enjoy this sprouts dhokla recipe made with loads of spinach. Is the famed khatta dhokla healthy? Yes, khatta dhokla is safe. Khatta dhokla is a fermented food which is easy to digest. Fermentation of foods increases the bioavailability of nutrients which helps the body to assimilate more nutrition. The microorganisms break down the complex protein, carbohydrates and fat efficiently thereby helping to assimilate more nutrients from the food. The bioavailability of proteins and Vitamin B content also increases. BUT, diabetics and weight loss individuals can only have a few pieces as the carb content is very high due to the high percentage of rice used. See why chola dal is healthy and must be used in dhoklas. Chola dal is high in fibre and protein rich. Good source of potassium and boon for diabetics and heart patients. Enjoy chola dal dhokla recipe and diabetic chola dal dhokla recipe made with spinach and methi leaves. See why buckwheat is healthy and must be used in dhoklas. Buckwheat is a very good source of Iron and good to prevent anaemia. Rich in folate and good food for pregnant women. Buckwheat keeps your heart healthy and high in fibre and diabetic friendly. We eat this healthy buckwheat dhokla very often for dinner in our family and our 12 year old daughter also loves it. 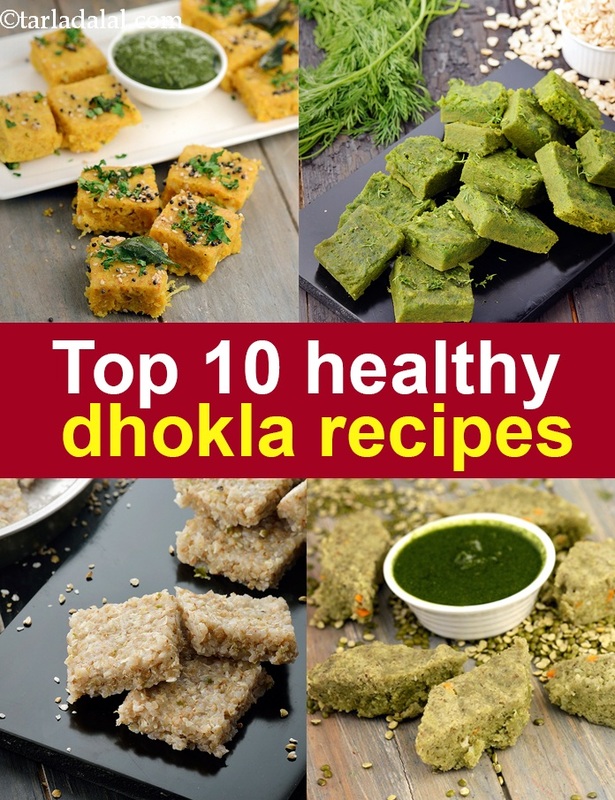 Enjoy our Top 10 Healthy Dhokla Recipes, Which Dhoklas are healthy? article and other breakfast articles below.